Among the few things I hated during my initial visits to the US (during the early 90s) was how difficult it was to find good tea. While coffee was ubiquitous everywhere you traveled and within offices, tea was difficult to find unless you were in upscale restaurants and hotels. Many a time, when you ordered tea, they assumed you wanted flavored iced tea. Thankfully, with the influx of more Asians in the US, that has now changed; you can even order ‘chai’ in the local Starbucks. Yet, having tea served in a super-sized foam cup with a single tea-bag dipped into (what seems like) a liter of hot water barely meets my definition of sipping tea! Therefore, it wasn't surprising that during my recent vacation in Europe I was mighty pleased when I found I could order a variety of teas in the trains of Switzerland, in English cafes, and almost everywhere else where one could hope to find hot drinks. 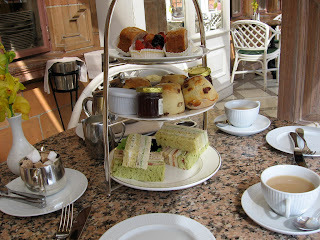 I was especially happy in England, where drinking tea has been elevated to a hallowed ritual of the afternoon tea. BTW, call this ‘high tea’ and they immediately know you are a tourist! 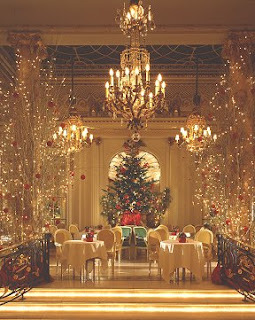 If you are in London and want the ‘premium’ tea experience, make a reservation at the Ritz. Alternately, I would recommend the Harrods (which, like the Ritz, is a destination in itself with a lot of history), or the Orangery in Kensington Palace. 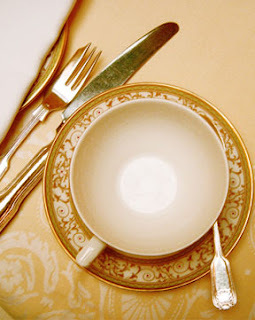 Tea at the Ritz is a formal affair and men need to remember their jackets to enter here. Served in the spectacular Palm Court, a choice of several varieties of tea, finely cut sandwiches, freshly baked scones, jam and clotted cream and a range of delicate pastries, combine to make for an unforgettable afternoon. At Christmas the Ritz becomes more magical than ever; a spectacular Christmas tree takes pride of place in the lobby, cascades of lights hang from the rotunda above. On selected dates during Christmas, tea will include a glass of Champagne, mince pies and Christmas cake with the usual stuff. At Harrods, you can have the traditional afternoon tea (from 3.45pm) served with finger sandwiches, patisserie, scones and clotted cream at the Georgian restaurant on the 4th Level. If you want to try something different, visit the Laduree Tea Room on the Ground level, the epitome of French style that will offer the world famous macaroons along with its range of teas and indulgent patisserie. Note: Picture of tea at Harrods by Sarah Brown. The Orangery is the place to visit for a quintessential Garden experience. Located in the middle of the gardens of Kensington Palace, the menu is typical garden-party fare: fluffy roasted pepper & goats’ cheese tarts, flaked salmon salads & a chilled dish of broad beans, boiled potatoes & pesto. It’s decently done, but the tiered ranks of cakes greeting diners upon arrival indicate that afternoon tea is the real reason to come here: fruitcake, black & white sables or winter berry tart are the perfect partner for a cuppa or two. To me (and many others around the world), the supreme tea of all teas is the Darjeeling Tea. Sourced from the 70 or so tea gardens on the Himalayan hill resort of Darjeeling has built a reputation in tea that has proven difficult to beat. Darjeeling gets its name from the Tibetan words for “Land of the Thunderbolt”. A popular Himalayan hill resort in north-east India, it’s tea gardens are situated on the steep hillsides with the Bengal plains directly south and the Himalayan crest directly north. Weather, soil, high altitude, and some of India’s oldest tea bushes have created unique teas that have resisted imitation elsewhere. I haven’t visited Darjeeling yet, but have heard many stories from friends and relatives of the spectacular views and the mountain rail journey (the train itself is a World Heritage site!). Darjeeling is renowned for producing some of the finest teas in India, but it also produces the widest variety of flavor of any single growing area. The elevation of a single estate may sweep from 2000 feet to up to 7000 feet, with the temperature and cloud cover varying widely. The best are the high-grown teas, where the cool weather slows the growth of the leaves and concentrates the flavor. Add to this the three distinct plucking seasons of first flush, second flush and autumnal, and the range of quality from even a single estate can vary enormously. Second Flush refers to the high-quality growing period late May through June, and is by no means ‘second rate’. Note: Darjeeling picture by Funky Chickens. Another place where great Indian teas are grown is Assam. The largest tea-growing area in the world with over 700 tea estates, Assam is a state in north-east India and lies on both sides of the Brahmaputra river. The place is home to wild elephants, rhinos, and India’s only indigenous tea plants. From the first eight chests of tea sold in the London auction of 1839, Assam teas have risen to become the pre-eminent choice of British brands, due to their strong liquor and perfect compatibility with milk. Here's how a well-known tea lover is said to have expressed his great love for tea: The first cup moistens my lips and throat. The second cup breaks my loneliness. The third cup searches my barren entrail but to find therein some thousand volumes of odd ideographs. The fourth cup raises a slight perspiration - all the wrongs of life pass out through my pores. At the fifth cup I am purified. The sixth cup calls me to the realms of the immortals. The seventh cup - ah, but I could take no more! I only feel the breath of the cool wind that raises in my sleeves. Where is Elysium? Let me ride on this sweet breeze and waft away thither. ~Lu Tung, "Tea-Drinking"
Ritz Royal English An exquisite blend, the rich malty taste of Assam blended with the fine flavour of Ceylon, wonderful colour of Kenyan, making this blend very well-rounded. Darjeeling First Flush Truly the Champagne of teas, a rare & wonderful experience, this Black tea, from the first tender new shoots grown between February and April on the foothills of the Himalayas, producing a wonderful light liquor with a delicate flavour of green muscatel. Assam Leaf (Tippy Orthodox) A full bodied black tea, high grown in the north of India, a golden tippy leaf yielding a rich aroma, strong, rounded malty flavour and attractive red liquor. Russian Caravan A blend of China, Formosa & Darjeeling leafs reminiscent of tea carried to Russia from China by camels. Earl Grey A large black leaf tea, China based, beautifully balanced with refreshing citrus bergamot, silky & smooth with a delightful aroma. Lapsang Souchong Imperiale A China large black leaf tea from the Fujien province, smoked over pine fires, a distinct smoky tea with a silky tarriness, wonderful depth of flavour. Jasmine With Flowers (green) A China based semi-fermented tea from the Fujien province, beautifully flavoured with jasmine flowers, wonderful perifime with delicate taste, a light gentle refreshing tea. Rose Congou / Pouchong A China black tea from the Guangdong province enriched with rose petals & flavoured with rose aroma, very gentle, light, a delicious tea. Moroccan Mint A wonderfully invigorating spearmint tea, caffeine free, highly scented, stimulating in the morning, soothing digestif. Elderflower A creamy musk-scented Summer Flower, comforting & wonderfully relaxing enhanced with sugar & honey. Camomile Heads A pretty infusion, calming, soothing & delicate, elegant aroma. Verveine / Lemon Verbene An elegant, sparkling lemon tasting tisane, refreshing, digestif. Passion Fruit & Orange A truly wonderful taste, apple, hibiscus, sweet orange peel blended with passion fruit & orange. I've never been to Ritz but always wanted to go there when I'm in London and of course the British know from their colonies resources how to get and make tee. I'm a Lapsang Souchong lass myself. Nice post! Now I feel thirsty! It was wonderful reading about our favourite drink, Tea and how it has adapted in different parts of the world. The servings you have mentioned looks really exotic and on another note, our Darjeeling Tea is also often compared with the Champagne....It was nice reading! @giddy tiger: Welcome, and thanks for pointing me to Teh Tarik. So many variations of tea around the world! Having said that I would suggest you visit Tea Centre off Churchgate when you visit Mumbai. @anil p: I know what you mean. Actually, I have to write one on my Indian tea experiences. Tea has so many forms in India (I had written earlier, but have to get some pics too). And I will indeed try th Churchgate Tea Center when I visit that area; thanks! A brilliant post. Can't start my day without the morning cuppa! @vishal: Thank you! Yup, nothing can get me started in the morning like a cuppa tea. 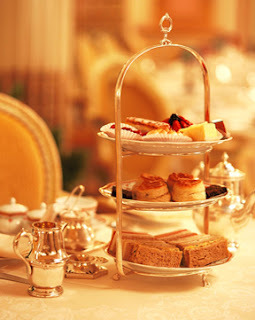 Next time you're in town, try tea at The Berkeley!